Central Heating & Boiler Installation, Servicing & Repair in Guildford. Buxton Heating are proud to boast many years’ experience of installing, servicing and repairing boilers in homes across Guildford and the surrounding area. We pride ourselves on providing honest, expert advice and delivering a service that has produced hundreds of happy customers over the years. Whether you’re looking to install a new central heating system or need boiler servicing or repair, please give us a call today and discuss your requirements. 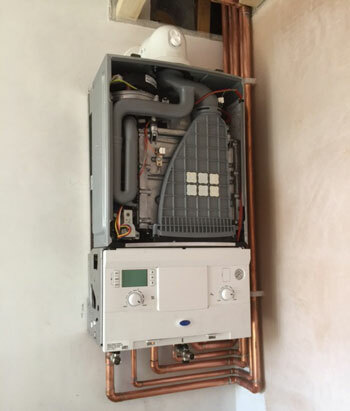 Combi Boiler? System Boiler? Conventional? Let our team of fully qualified and experienced gas engineers discuss the options available to you, to ensure you get the central heating solution that’s right for your property and energy requirements. We possess a wealth of knowledge and experience of installing a wide range of domestic boilers including Worcester Bosch boilers, for whom we are accredited installers. We pride ourselves on providing absolute peace of mind for our customers by delivering a reliable, trustworthy service and the highest standards of installation. Our team are proud to possess many years of experience of boiler servicing in homes across the Guildford area. Not only do we provide a thorough inspection of the boiler, its controls and operation, but we also perform a flue test to check for any harmful emissions. By regularly servicing your boiler you will help to maintain its condition and ensure it provides you with many years of reliable service. If your boiler has developed a fault, you can rely on the team at Buxton Heating to do their very best to resolve the issue as quickly and efficiently as possible. Our engineers have many years of experience of working on and repairing a huge range of boilers, so if you’ve got a problem with your boiler give us a call today.